CirKids is our youth training and performance program, a 36-week (10 month) program that runs from September to June. Our professional coaches tailor circus classes to match the students’ age and stage. Younger kids learn the basics of circus arts with a focus on play and movement basics. Older students focus on group act development, basic theatre skills, and presentation skills. For children who are ready to participate independently and follow directions. Focuses on basic circus skills and circus safety in a fun environment. Children will be exposed to dominant movement patterns used in circus and coordination challenges, as well as balance, basic shapes, and body positions used in circus acrobatics. Class for 45 mins. *** Please note, students must be 3 years old and toilet trained in order to participate. Designed for parents with children aged 3-5, participants will learn fun and engaging circus skills as they work with their children. Learn juggling, bouncing basics on trampoline, pyramids and introductory aerial skills. Registration is for one adult accompanying one child. Class for 1 hour. Focuses on fun, skill development, social interaction and large movement activities. Children learn the basics of juggling, unicycle, tumbling, trampoline, silks, and trapeze. This class focuses on play with an introduction to theatre skill basics. Class for 1.5 hours. Children learn juggling, unicycle, silks and trapeze, tumbling, and trampoline and take part in balancing activities. This class focuses on play, presentation skills, theatre skills, and movement basics. Class for 2 hours. Teaches all the basics of a traditional circus program: acrobatics, aerials, balance activities, trampoline, object manipulation, and unicycling. Focuses on group act development as well as basic theatre and presentation skills. Class for 3 hours, or 4 hours for Ringmasters Plus, where the extra hour allows for more intense training and a wider range of skills to be practised. In addition to the monthly tuition, there is a monthly $20 volunteer deposit. Teaches the basics of a traditional circus program, in the afternoon! $15 annual membership and $25 annual insurance fees apply. 10% discount on tuition for consecutive siblings. In addition to the monthly tuition, there is a monthly $20 volunteer deposit. Class for 2 hours. This class is for students interested in more intense training: please note this class occurs bi-weekly with one weekday class and one weekend class (Monday OR Wednesday, and Saturday OR Sunday). 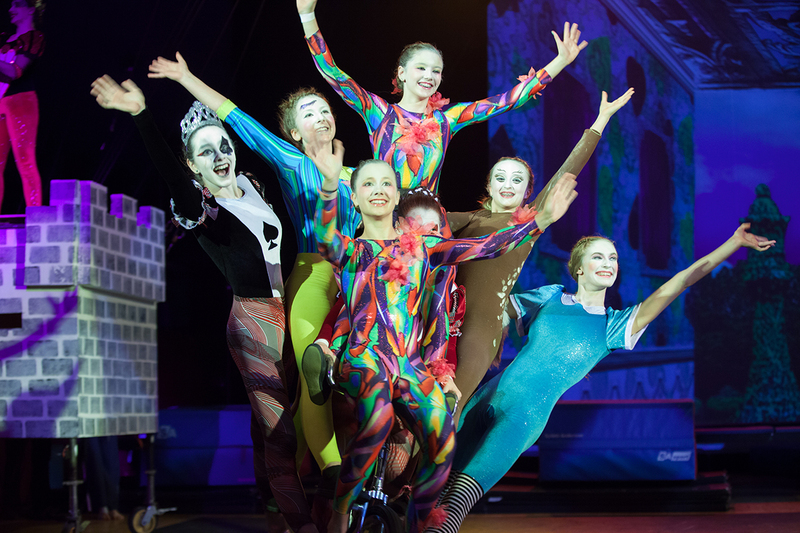 Students continue training in all elements of traditional circus with an emphasis on improving skills and technique. Presentation skills, group act development, and movement and theatre skills will be addressed. Students train 2 times a week for a total of 7 hours (3 hours Mon. AND Wed. and 4 hours Sat. OR Sun.). In addition to the monthly tuition, there is a monthly $20 volunteer deposit. Students must register for both Centre Ring and Centre Ring II. This class teaches all the basics of a traditional circus program while focusing on group act development and basic theatre and presentation skills. It is ideal for students who are not sure yet whether they want to take circus to the next level. Expectations: Training will be intensified and will require more focus from the students. Students train 2 times a week for a total of 5 hours. This comprehensive intermediate circus skills development program will focus on group act development and performance/stage skills. Participants will engage in small performances on campus and at community events. Students will perform as featured pre-show entertainment at the annual show. Expectations: Commitment is particularly important in Ensemble as this is when training becomes more focused as coaches prepare students for the performance program. Students must be proficient in at least 2 of the main 7 disciplines covered at this level in order to be invited into the program. Disciplines include acrobatics, trampoline, hand-to-hand/handstands, aerials, dance, unicycle, and juggling/object manipulation. Students train 3 times a week for a total of 7.5 hours. In addition to the monthly tuition, there is a monthly $15 performance fee and $20 volunteer deposit. Students must register for both Ensemble and Ensemble II. For students interested in more intense training and/or for those wishing to prepare for the Performance Troupe. Students will be able to start selecting their area(s) of specialization, on top of getting all-around training in general circus arts. This class also offers physical preparation in strength, flexibility, and movement for further training. A variety of performance opportunities will be available, including supporting the Performance Troupe in the annual show. Expectations: Commitment is necessary for this program. Students must be proficient in at least 2 of the 7 main disciplines covered at this level in order to be invited to audition. These disciplines are tumbling, trampoline, hand-to-hand/handstands, aerials, dance, unicycle, and juggling/object manipulation. Students train 3 times a week for a total of 10 hours. In addition to the monthly tuition, there is a monthly $20 performance fee and $25 volunteer deposit. Students must register for both Apprentice and Apprentice II. Students continue their overall training while pursuing a specialty. Presentation skills, group and individual act development, dance, movement, and theatre will be taught. Commitment is essential as students will entertain throughout the year at festivals and community events, ending with the annual May show. Students will have to audition each year to keep their place in the class, annually reaffirming their commitment to the high time and energy demands of Performance. Expectations: Commitment is necessary for this program. Students must be proficient in at least 3 of the 7 main disciplines covered at this level in order to be invited to audition. These disciplines are tumbling, trampoline, hand-to-hand/handstands, aerials, dance, unicycle, juggling/object manipulation. Students train 3 times a week for a total of 12 hours. In addition to the monthly tuition, there is a monthly $25 performance fee and $30 volunteer deposit. Students must register for both Performance Troupe and Performance Troupe II. If you are a current CirKid family, please also check out our Volunteer Info page.